Many people are unaware of the calorie content of alcohol, a survey shows. Four in 10 did not know a glass of wine has the same calories (120) as a slice of cake, or that a pint of lager and a small sausage roll have 170 each. The poll of 2,000 adults in England was carried out as part of the government's drive to curb people's drinking habits. The campaign also stresses that a heavy drinking session is often followed by an unhealthy breakfast, which again helps to pile on the pounds. The Know Your Limits campaign has in the past focused on other consequences of drinking, such as disease risk. But to coincide with the focus on weight, the Department of Health carried out research showing a regular beer drinker, who downed five pints a week or 250 over the course of a year, packed away the same number of calories as someone eating 221 doughnuts over the space of 12 months. 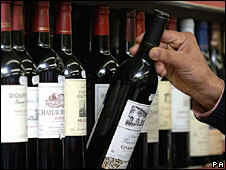 It also revealed the average wine drinker consumed 2,000 calories each month. Over the course of a year, that is the equivalent of eating an extra 38 roast beef dinners. Health minister Phil Hope said: "Regularly drinking more than our recommended daily limits can have a knock-on effect on our health, including an expanding waistline. "It's not only the calories in the drinks themselves that can help to pile on the pounds, we're also more likely to eat fatty foods when we've had one too many." Heather Caswell, of the British Nutrition Foundation, added: "Most people would baulk at consuming a full glass of single cream, but wouldn't think twice about a couple of pints. "But the calorie content is similar and, over time, excess alcohol intake is likely to lead to weight gain." And a spokesman for the Drinkaware Trust added: It's imperative we are in the know when it comes to what we are drinking. "